Don died peacefully, surrounded by his family and friends, at Coming Home Hospice. 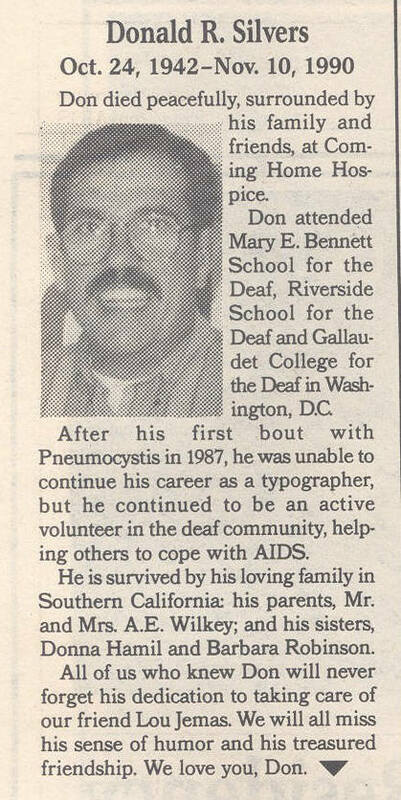 Don attended Mary E. Bennett School for the Deaf, Riverside School for the Deaf and Gallaudet College for the Deaf in Washington, D.C.
After his first bout with Pneumocystis in 1987, he was unable to continue his career as a typographer, but he continued to be an active volunteer in the deaf community, helping others to cope with AIDS. He is survived by his loving family in Southern California: his parents, Mr. and Mrs. A.E. Wilkey; and his sisters, Donna Hamil and Barbara Robinson. All of us who knew Don will never forget his dedication to taking care of our friend Lou Jemas. We will all miss his sense of humor and his treasured friendship. We love you Don. 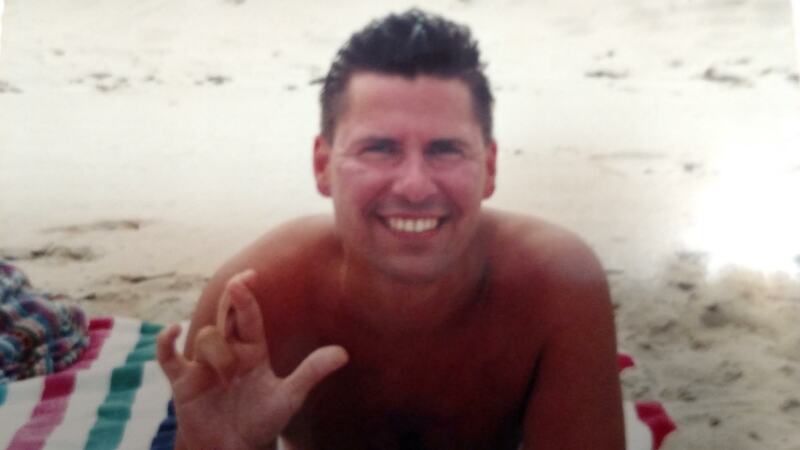 The deaf community has lost its sign language interpreter, Jay Wilson, to AIDS complications. Born in Akron, Ohio, to deaf parents, Jay had been very active in this community, as well as a member of the Rainbow Society for the Deaf. He moved to San Francisco in 1978. 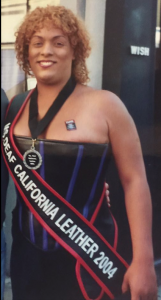 Jay was a founding member and on the board of the Deaf Community AIDS Project (DCAP). At every major event like the Gay and Lesbian Freedom Day Parade or the annual AIDS Candlelight March, Jay stood onstage and signed to the deaf. A funeral Mass was held at Mission Dolores Basilica, and he was buried in the Colma Cemetery. Surviving are his parents, Clyde and Nellie Wilson; sisters, Priscilla Metzler and Gloria Roberts; brothers, Jerry and Windsor Wilson; nephews, Travis, Derrick and Jeremy; nieces, Nicole and Jacqueline; two dearest friends, John and Helen; and the others Jay shared his friendship with. The memorial service will be at San Francisco Club, 530 Valencia St., SF, on Saturday, June 22, 1-5 p.m. For information about the memorial service, please call the California Relay Service (800/735-2922) or James at 510/261-9876 TDD or John at 415/323-0402 TDD. Constante was a very good person who got along with everyone. He loved to dance and was very talented. We all looked up to him and his love of dance, he was deaf and could out dance all of us. Ronald died in Connecticut after living in Seattle for many years. If anyone has an obituary or additional information about Ronald, please submit it. If you knew Ronald, please consider sharing a memory about him in the comments area below. Rosie Lanier Rodriquez was born on January 16, 1969, in Ft. Worth, Texas. Her parents were of Black, French, and White ancestry. She was assigned male at birth and given the name Marvin Earl Wilson. 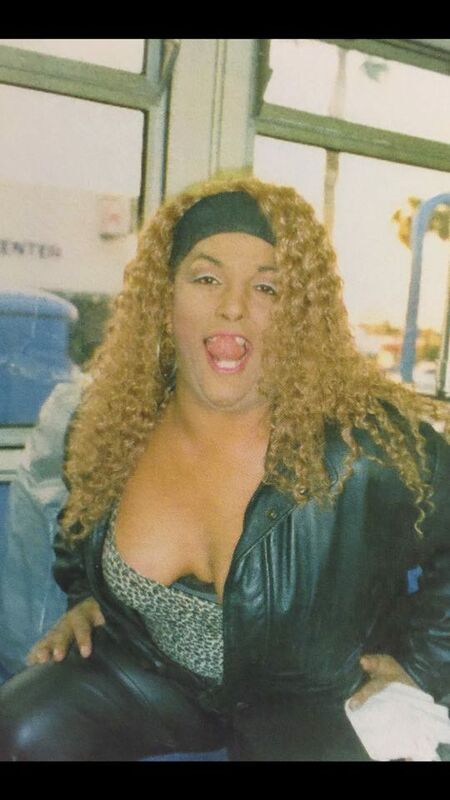 In September 1996, while living in San Francisco, Rosie made one of her biggest dreams come true and began her transition from male to female. She no longer felt trapped in the wrong body. She also legally changed her name to Rosie Lanier Rodriguez. Rosie was outgoing, enthusiastic, well educated and always up for an adventure. She loved art, cooking, gymnastics, and was a fierce advocate for the Deaf community. Rosie also enjoyed performing (especially lip syncing) and performed at the 1994 Miss Gay Texas and 2004 Miss Deaf California Leather contests. Rosie was the inspiration to us all. She was always full of laughter, life, happiness, and gave us new perspectives and an appreciation for the world of comedy. She departed from this Earth on July 20, 2006 and is dearly missed. Greg Smith was a dear friend of mine, and beloved by many in the Deaf and Interpreter communities. Greg was funny, charming and extraordinarily bright, had a great interest in languages and linguistics, and a passion for Russian Literature and language which pre-dated his exposure to ASL. He learned American Sign Language as a result of his relationship with his Deaf partner, and eventually become a skilled ASL/English Interpreter. At a time when there were few formal Interpreter Training Programs, Greg was committed to continually growing and learning as an Interpreter through his active involvement in Northern California Registry of Interpreters for the Deaf (NorCRID), and by taking classes and workshops that were offered in the community. Like many of us who came into the field in the late 70’s and early 80’s, Greg was deeply involved in the social justice movements and the fight for civil rights in the Deaf Community, the LGBT Community and for people with disabilities. He often volunteered as an Interpreter at rallies and meetings, and was a participant in activities and gatherings sponsored by the Rainbow Deaf Society, the original SF Bay Area Deaf LGBT organization. Greg was a Staff Interpreter at Laney College, Cal State University at Hayward (now East Bay), and at the Center for Independent Living and also worked as a freelance community Interpreter. 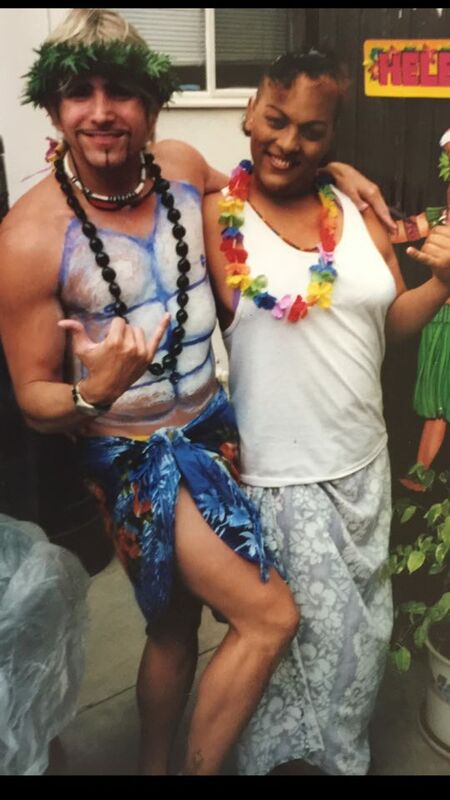 Greg was one of the first people in our community to be diagnosed with AIDS. Although treatment and medication has come a remarkably long way in the ensuing decades, in the early and mid-1980’s, AIDS often resulted in severe illness, debilitation and death. As Greg had been such an active participant in our community, many Interpreters and Deaf people were involved in providing support and care to Greg during the course of his illness. One of the most remarkable periods I remember from that time was Greg being so ill he needed to be hospitalized in the ICU. Greg’s pneumonia required him to be intubated and he was thus unable to speak. We organized a group of his Interpreter friends to be in the hospital at his side around the clock to interpret for Greg during the weeks he spent in the ICU. Although he could not speak, he was able to sign, and thus could communicate via Interpreters with his doctors and nurses in the ICU. Before their eyes he transformed from a non-communicative “patient”, to a human being who was able to display his sharp wit, sense of humor and keen intelligence. Greg often said after this how grateful he was to have learned Sign Language. Although there were many poignant moments with Greg during the period of his illness, the most touching was seeing the impact the support of his “beloved community” had on his family. His parents in particular were so moved by the outpouring of love and care to their son from Greg’s friends and colleagues. 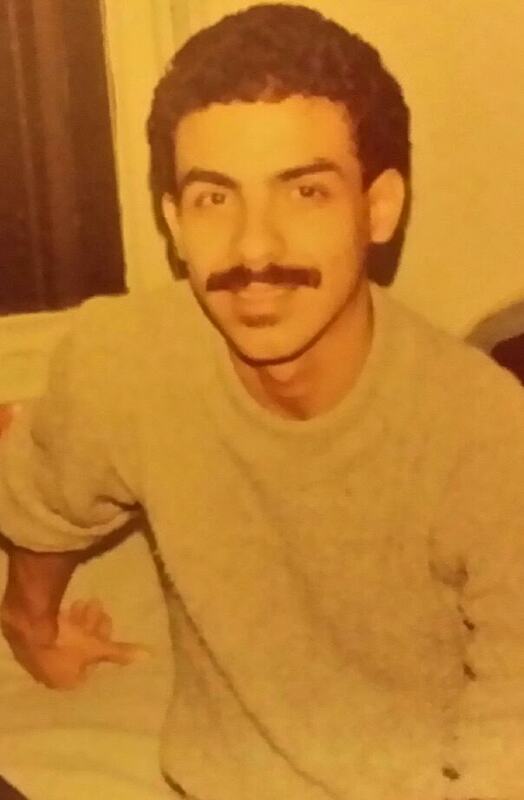 After a long and courageous battle with AIDS, Greg passed away in December of 1984. Interpreter colleagues, members of the Deaf Community, family and friends overflowed at Greg’s memorial gathering. Although there was tremendous sadness at his passing, the memorial was indeed a celebration of Greg’s life, and a joyous and at times uproariously funny testimony to the impact he had made on all of our lives. As a tribute to Greg, NorCRID set up the Greg Smith Memorial Fund in 1985 to help NorCRID members during emergencies, particularly medical emergencies. Every year the money raised at the silent auction at the Annual NorCRID Conference goes to replenish this fund. I was so delighted and touched to see all of the work that went into this year’s auction, and the money raised in tribute to Greg. 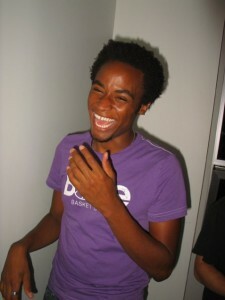 Best of all was seeing the picture of my beloved friend, a “twinkle in his eye”, that wonderful face, his smile. Gone far too soon, my dear Greg, but you are still having an impact on our community. Terry Lewis Mackin, Jr., was from Charlotte, North Carolina. He was born on December 6, 1981, and passed away in Los Angeles, California on October 11, 2008, at the age of 26 years, from pneumonia-related complications of HIV. Terry is and will always be fondly remembered by many people, especially those who attended Rochester Institute of Technology from 2000 – 2008. He formed excellent friendships with many Deaf students there. Terry was always there to listen to them, and was there for a lot of the fun and memories. He was one of the most genuine human beings you would ever meet, who could easily make you smile and laugh. He could easily connect with anybody. He never had an enemy, and had in himself a sincere kindness toward all. He saw everything without the slightest malice or reproach. He was one of those rare people who loved people in general with an amazingly positive energy constantly emanating from him – always smiling, always rolling on in pursuit of interesting goals. At RIT, Terry was part of the dance group Flux Fusion, and entertained many with his excellent dancing skills. He graduated with a degree in Business Management in 2008 and departed for Los Angeles with aspirations to become a career dancer. It was briefly after his arrival in Los Angeles that he passed away suddenly. It is exceedingly unfortunate that he never reached his dream in Los Angeles. Many of his friends have expressed the consensus opinion that they were fortunate to have experienced him as a wonderfully positive force in their lives. Terry is deeply missed by those many friends. 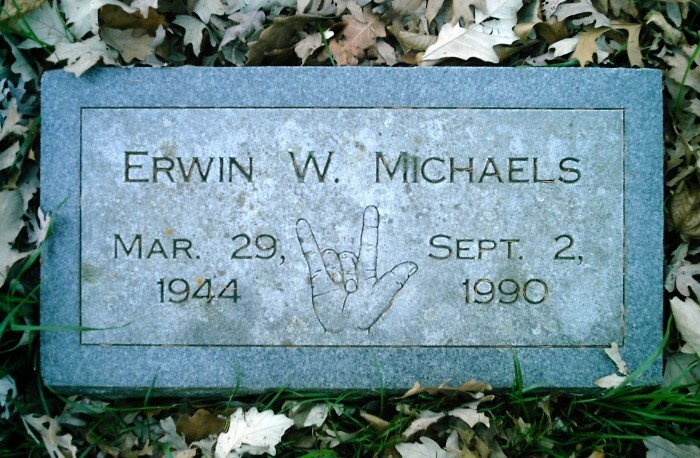 Erwin W. Michaels was born on March 29, 1944 in Chicago, IL and died on September 2, 1990 in Madison, WI. If anyone has an obituary or additional information about Erwin, please submit it. If you knew Erwin, please share a memory about him in the comments area below. John was born to a Deaf family on August 10, 1948 in East Los Angeles. John was named in honor of his grandfather. His mother found the name Darcy in a book of names. John went to the Mary Bennett oral school in Los Angeles. When he was nine years old, he transferred to the Riverside School for the Deaf. He graduated from there in 1967. John went to Gallaudet University for two years and then transferred to California State University at Northridge, where he received a BA degree in 1975. He then moved to San Francisco and attended San Francisco State University. In order to fulfill the university’s foreign language requirement John traveled to Taiwan to study Chinese. In 1979 John received a master’s degree in fine arts from San Francisco State and accepted a position as an American Sign Language instructor there. John was an independent and extremely creative man. He truly was an artist. He explored many different philosophies in his life. He lived his life in the manner that he wanted to and didn’t worry about what other people thought of him. John was very involved in the Deaf community and a strong supporter of ASL. He believed ASL should be left alone to its own development and not controlled by English. In April of 1989, John was diagnosed as having progressive multifocal leukoencephalopathy (PML). True to his nature, John chose the way in which he would live the little time he had and remained strong spirited as the illness rapidly progressed. John left his body on May 19, 1989 at 3:05 AM. He was in his home, as he had wanted to be. His friends were close by. John had a great and rich life. Our lives will be fuller and brighter for having known him. John will continue to live on in our hearts. Oh Saturday, August 12 at 12:00 John’s friends will gather to sew a Names quilt in his honor. Please join us at 2362 Market St. (across from Castro). You may bring materials for the quilt or share what we collectively have. We are planning to go out to a local restaurant after we finish. We hope to see you there. If you cannot make it, please join us with your spirit. Contributions may be made in John’s name to the Rainbow Deaf Society. Please detach the bottom part of this form and use the enclosed envelope. Please make checks payable to Rainbow Deaf Society for CAP, and note that the contribution is made in John’s honor. 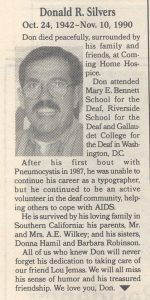 Buzzy Contrerio was one of first Deaf people in the Washington, D.C., area to pass away to AIDS. This was around 1988. Buzzy’s real first name was Leo. He was my neighbor and he loved to walk his tiny dog everyday. He graduated from Michigan School for the Deaf around 1968.